Within each district of East Germany, the Notorious Stasi Secret Police (The Ministry for State Security (German: Ministerium für Staatssicherheit, MfS) were provided with an operational command and communications bunker. In many districts an alternate command bunker was also constructed. East Germany was divided into 15 administrative districts so there are over 20 similar command and alternate command bunkers which are all built to a similar style. The bunkers all were built underneath buildings, but in many cases these buildings are long gone and the original entrances, which comprised of steps are backfilled. The odd ones that are open are entered by the emergency exit which looks exactly like a generic DDR manhole cover. These bunkers were not used as a normal place to conduct operations and work from, but as such were emergency bunkers for use in crisis and emergencies or time of war. The buildings above ground were generally used for the day to day operations at the main command bunker, and the alternate bunkers were generally just the bunker with barracks or a shed on top to disguise the entrances. The alternate bunkers were only meant for use in the event of the main bunker being untenable. These command bunkers, like the one in Bad Berka, were of a type called “2Vx”. Various districts had different sized versions of the basic Stasi bunker (the ‘x’ was substitued for various numbers) but they all followed a similar layout with the bunker split into 2 areas, left and right with one side being for ‘living’ type activites (sleeping, eating, toilets etc) and the other side being the operational side with all the radio and other equipment. Provision was also made for independent operation with generators, C02 scrubbers, borehole water and air filtration plant all being provided. The intention was for the bunkers to be able to work independently (food, water etc) for around 14 days. At Bad Berka evidence of all these things are extant. Originally at the bunker in Bad Berka, there were two main entrances, which could be closed by rollable steel plates. A 6ft wide concrete stairway continued downwards for around 20ft. The main entrances were originally located under a shed. All the surface buildings and entrances were demolished in 2000 after the bunker was increasingly being used as a den and extensive vandalism occurred in parts of the bunker. The tunnels of the bunker consists of 20 parallel spaces, laid out in a ladder fashion which is about 6ft wide, 8ft high and approx 50ft long. 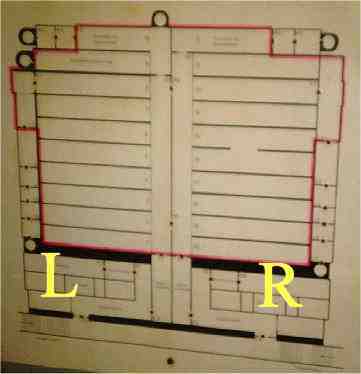 Each arm of the ‘ladder’ was closed off with a door that was marked with a number and indicator of the use of the room. 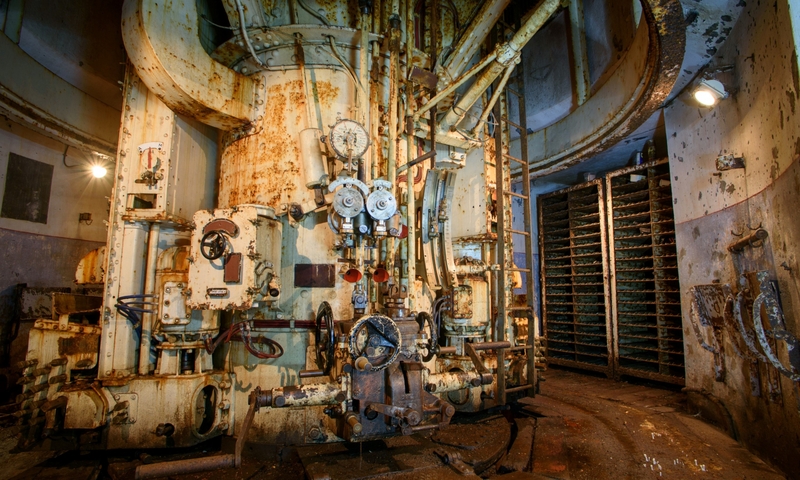 The bunker is mirror imaged on itself with the left and right hand sides being able operate independently, both sides were provided with air filtration, generators, c02 scrubbers and air plant. The 2 sides were able to be sealed off from each other by blast and gas proof doors. The main entrances and exits were also provided with blast doors and air locks. The bunker is located in a forest in the Erfurt district of the former East Germany, it was built alongside a water works to disguise its true purpose. It was built in the early 1980’s. It had 2 main entrance and 6 emergency exits. Usable Floor area: approx. 8500 square feet. The bunker as it is at the moment has between 6 to 12 inches of water on the floor and is quite damp in some areas. Some of the further areas are quite dry and in good condition. Some areas are vandalised, some are natural decay and some bits surprisingly good condition. Obviously there is no power or utilities. The large command area in the middle is burnt out but a lot of equipment and utilities remain extant but decayed – enough to work out what area was use for what. The bunker is sealed as of 2012.